GENE EDITOR Jiankui He, shown in a lab in Shenzhen, China, on October 10, has announced the birth of the world's first gene-edited babies. 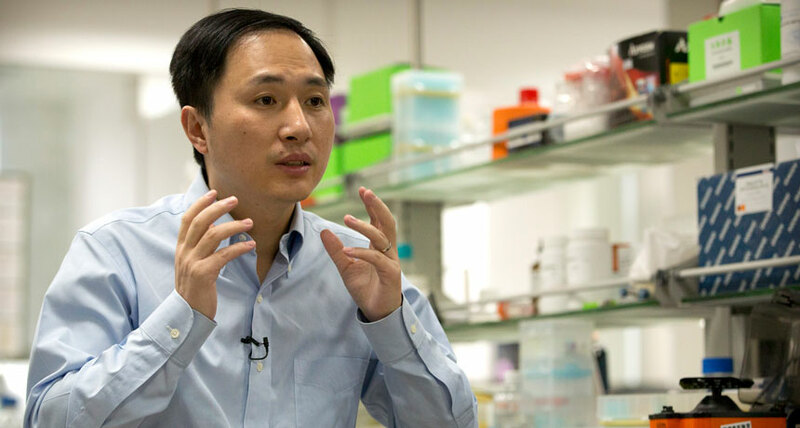 A Chinese scientist's surprise announcement on the eve of an international human gene-editing summit that he has already created the world's first gene-edited babies has led to swift condemnation. Jiankui He is expected to discuss his work November 28 in Hong Kong at the second International Summit on Human Genome Editing. But in an interview with the Associated Press, and in a video posted November 25, He announced that twin girls with an edited gene that reduces the risk of contracting HIV “came crying into this world as healthy as any other babies a few weeks ago." That announcement sparked outrage from many researchers and ethicists who say implanting edited embryos to create babies is premature and exposes the children to unnecessary health risks. Opponents also fear the creation of "designer babies," children edited to enhance their intelligence, athleticism or other traits. He, on unpaid leave from the Southern University of Science and Technology of China in Shenzhen since February, objects to the term designer baby. "Call them 'gene surgery babies' if one must or better yet ordinary people who have had surgery to save their life or prevent a disease," He and colleagues wrote in a perspective published online November 26 in the CRISPR Journal. But in the video, He said that he realizes his work will be controversial, and he's willing to take the criticism. Some families need the technology to have healthy children, He said, adding that enhancing intelligence or changing hair or eye color are "not things loving parents do" and should be banned. Yet many researchers and ethicists argue that He's editing of the twin's DNA was not lifesaving nor does it prevent disease. Although the girls' father has HIV, there are safer ways to protect someone from contracting the virus, which makes the engineering both unnecessary and unethical. The scientists involved in the announcement "have knowingly violated the ethical norms surrounding this technology," says Josephine Johnston, a lawyer and bioethicist at the Hastings Center, a bioethics research institute in Garrison, N.Y. The researchers are aware that the scientific community thinks that gene editing is still not safe or appropriate for use in human embryos. "You could even wonder whether they're doing this for attention," she says.